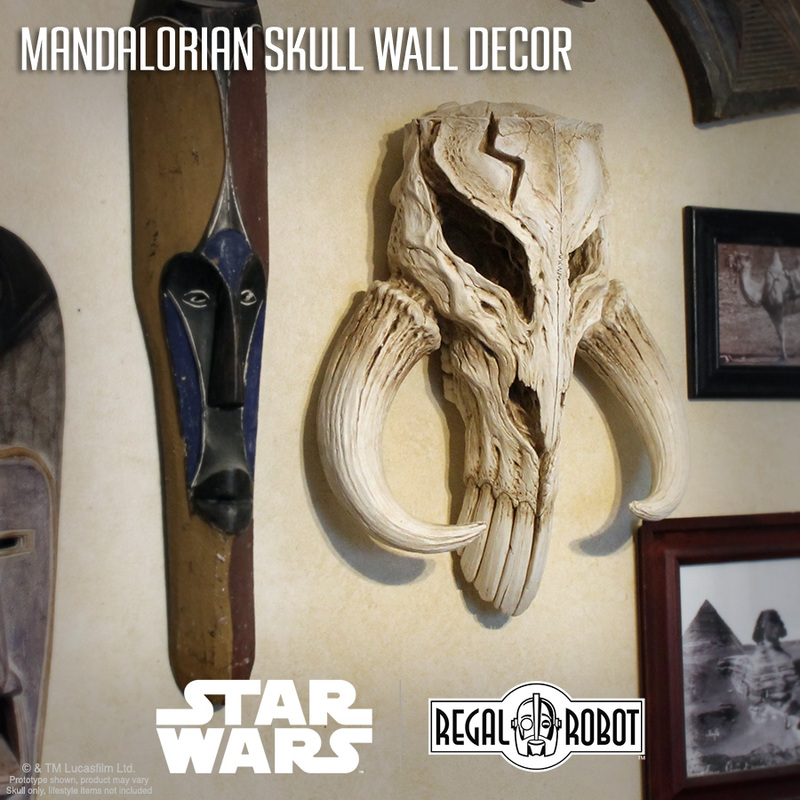 Behind the Scenes Spotlight – Creating our Star Wars™ Mandalorian Skull Wall Decor sculptures! With his debut in Star Wars: Episode V the Empire Strikes Back, Boba Fett was an instant icon. Shrouded in mystery, a huge part of his mystique come from his multi layered costume and heavily weathered armor, all of which hinted at backstory and history. Looking closer, Fett’s costume includes iconography and symbols, and none is more recognizable to Star Wars fans than the famed skull sigil seen on his left shoulder armor. Our Mandalorian Skull Wall Decor draws inspiration from that 2-D logo style art work from the film and brings it to life in a fascinating new way, as a full 3-D wall hanging sculpture that imagines what this alien creature skull might’ve looked like. Like our other current offerings, these sculptures were developed and are created in the USA. This is also very much a hand crafted product. Here’s a little more insight into how we’ve developed this exciting new way to bring Star Wars into your home, office or fan cave! It all starts with the incredibly talented California FX artist, Miyo Nakamura, who we worked with to create the sculpture for this 17″+ tall wall decor sculpture. Miyo worked in a water based clay and hand sculpted the incredibly detailed skull. She developed a truly beautiful interpretation and turned the original flat art into a fascinating, fully three dimensional creature skull. Fx artist Miyo Nakamura hand sculpts the prototype for this Star Wars art in clay. When Miyo completed the incredible clay sculpture, quite a bit of work remained! We now needed to create a way to reproduce that otherwise fragile clay. This is called molding and in this case, a cleverly devised two part mold was able to capture the complex shape as a single piece of art. That mold was created with silicone and fiberglass and would eventually produce the first resin copy of the sculpture, which would be used to create the production molds. 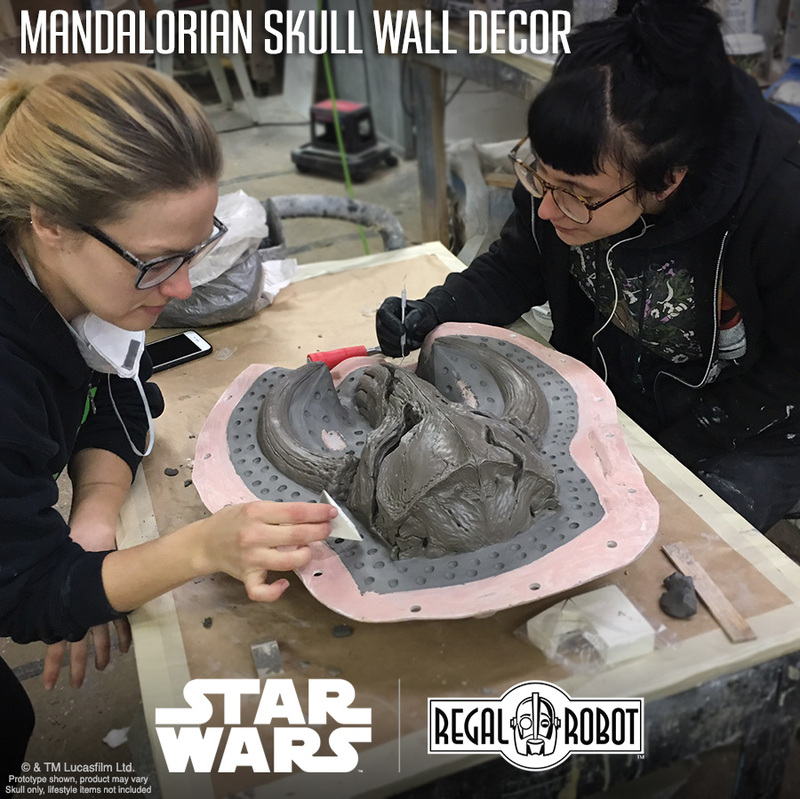 Tianna Atwood and Camille Smolucha prepare the Mandalorian Skull wall decor sculpture for molding. To make each copy of our Mandalorian Skull wall decor sculpture, a relatively large and heavy mold is prepped and bolted together, then mounted in a frame to be roto-cast. This allows us to pour several pounds of a liquid resin into the mold and slowly turn the mold in all directions, allowing for a hollow final casting. We reinforce that resin with a backing of a dense, rigid polyurethane foam, to give the sculptures added stability, durability and a more solid feel. We hand paint ever skull. 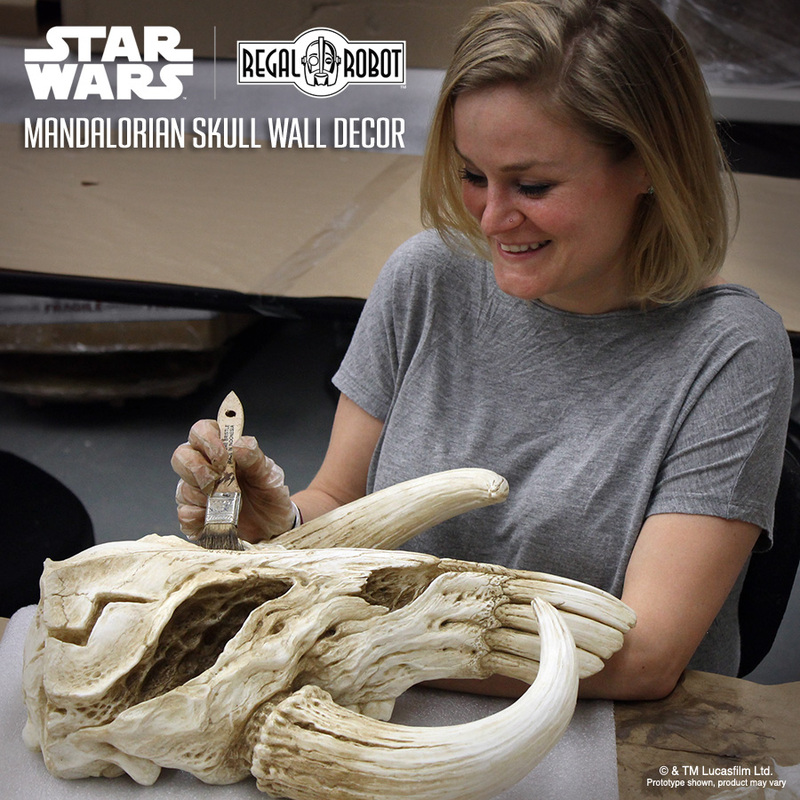 Here Melissa Dooley puts the finishing touches on one of our Mandalorian Skull wall decor pieces. Each skull is then prepared for painting by hand. This includes cleaning away any mold release agents, removing any remnants of the parting or seam line, and laying a base bone white tone onto the resin. Our artists continue the hands-on work by aging and staining each with layers paint for a realistic bone look. This antiquing is done in the same style as you’d find on a film set, and that’s intentional. We wanted to be sure that this creation fit in with George Lucas’ concept of a “used universe” seen throughout the Star Wars galaxy. A finished Mandalorian skull, a symbol instantly recognizable to Star Wars fans, presented in a new way as sculptural wall art. The end result is truly inspired decor. Star Wars will always spark our imaginations and we’re so excited to have this chance to find details in these films that exist in one form and bring them to life in a new way. 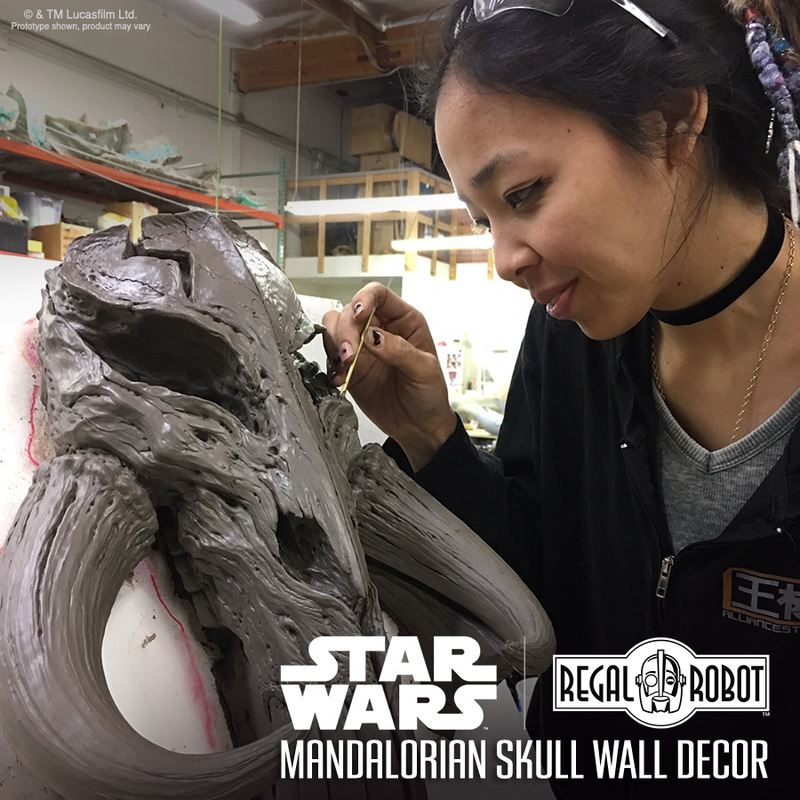 We hope you’ve enjoyed this peek behind the scenes and if you’d like to learn more about this official Star Wars sculpture and decor creation, please visit our Mandalorian Skull Wall Decor page for many more photos and full details about this amazing piece of art, or to order yours today! And if you don’t have the space for the 17″ wall decor? Check out our Mandalorian Skull Mini Sculpture, the perfect way to show your Star Wars side on your desk, shelf or in the palm of your hand! At Star Wars Celebration Orlando this year, Jordan Hembrough stopped by to talk with Tom about our Mandalorian Skull Mini Sculptures and Wall Art for the Star Wars Show!